Author's note: This is a draft/outline of a more thoughtful piece coming soon! Keep your eyes peeled! Some background: originally opened in 1963 as part of the Trans-Manhattan Expressway, the newly renovated George Washington Bridge Bus Station is a significant fixture in New York City's regional transportation. The original bare-bones terminal was closed in its entirety in 2013, with plans for a 2015 reopening. It didn’t reopen until 2017. Well, good news and bad news. The good news is that, on the inside, the new terminal is relatively comfortable, attractive, and easy at, at least on the upper, bus-boarding level. It has a pleasant enough waiting room, clear signage, restrooms, seats, and ticket machines (is two enough, however?). It has gorgeous views, and feels very open, taking tremendous advantage of its location next to the bridge and Pier Luigi Nervi's architecture. Even the boarding area is nice, with clear signs helping people get where they want to go. For all that, however, it is bare-bones. The waiting room offers seats... and nothing else. A wonderful opportunity to mix some retail and community space for (and, in turn, taking advantage of) travelers has been missed. I'm also not quite sure the space and facilities are significant enough for the amount of travelers (although on that I admit I could be wrong). The rest of the structure, however? The lower levels will be a cramped, sterile shopping mall. If the one current tenant—Marshalls—is any indication, there will be no local businesses inside. Worse, the interior mall space doesn't interface with the street at all. It is a structure which will do next to nothing for the community or its urban fabric. The worst is the exterior. The terminal is over an expressway, is surrounded by far-too-busy roads, and is composed of dehumanizing, bare concrete which soars over the street. It’s street interface is terrible. And nothing has been done blank, dehumanizing sides of the structure, something which should have been job one. I don't want to be entirely negative: as a transportation space, it is pleasant enough, and hopefully it will encourage more to use its buses to travel between New Jersey and New York. However, as has been the case with almost every structure the Port Authority has ever built, no effort has been made to craft an important, urban space, the type of space such nodes should be. Originally posted on Instagram and Facebook. 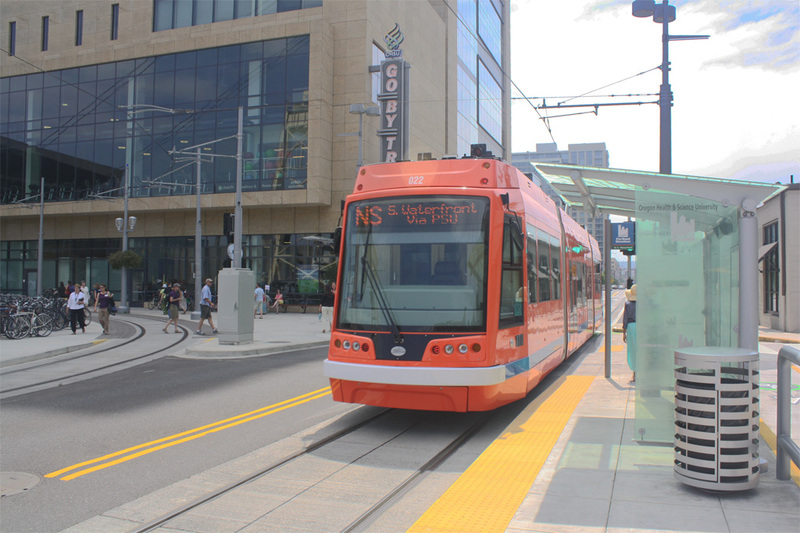 The Portland Streetcar at Ohio State Health University1. For those of you who haven't heard, last week, in his State of the City address, New York City Mayor Bill de Blasio officially threw his weight behind a proposal to build a streetcar line along the Brooklyn-Queens waterfront2. With a planned length of around 16 miles, and an estimated cost of two and a half billion dollars, this (at least partially) mixed-traffic streetcar would be New York's first major investment in crosstown travel since the Independent Subway's Crosstown Line (today's G train) was constructed in the early 1930s.